Canada is at a turning point. Plummeting oil prices, lacklustre economic performance, a petrodollar, pernicious climate change and structural youth unemployment illustrate the need for a shift from a resource economy appropriate for the industrial age to an innovation economy appropriate for the digital age. Toronto, specifically, can lead the way and become a global centre for innovation, entrepreneurship, breakthrough science, rich culture, open government and prosperity as a whole. In this special innovation edition of the Star, I’ve helped curate stories outlining mind-boggling developments, and even written a few, in the hope that you will become motivated to join in, if you haven’t already. 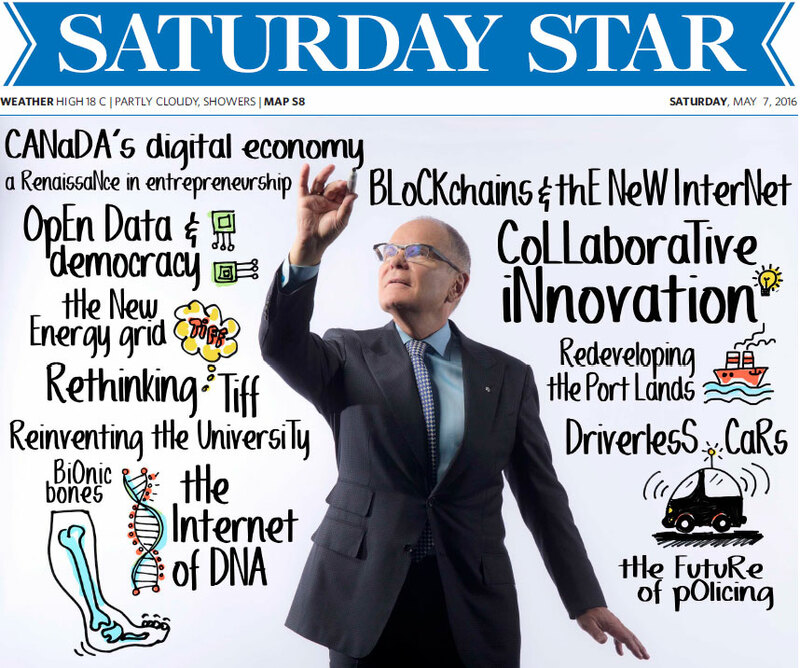 Download and read the front page of the Toronto Star: Innovation Edition and be sure to pick up a copy of the paper for the entire issue, which includes multiple articles on blockchain revolution and a full page spread on page 2 written by Alex Tapscott. You can also read the front page article online.